In Tribe CREMATOGASTRINI. This major Tribe is in great need of extensive revision, and Belshaw & Bolton (1994b) remarked that no synthesizing taxonomic studies had been undertaken. Diagnostic features - Mandibles with four or five teeth. Antennae 10- or 11-segmented. Eyes present, usually well developed, set at or just behind the mid-length of the head. Promesonotal suture usually a weak impression. Metanotal groove impressed, often deeply so. Propodeum usually armed with a pair of spines or teeth, rarely these are reduced to tubercles or are absent. Petiole dorsoventrally flattened, without a node, the dorsal surface weakly convex to concave. Postpetiole a node, often with a median longitudinal groove, attached to the dorsum of the first gastral segment. Gaster heart-shaped or triangular in dorsal view. Sting spatulate. Tarsal claws simple, often large. The mode of attachment of the postpetiole to the gaster allows the very characteristic defence posture in which the gaster is turned forwards over the alitrunk. Many members may have economic importance, especially as several species are among the dozen or so dominant ants which effectively determine much of the insect fauna of cocoa and other trees. Bernard (1952) described them as omnivores and very active, adding that genus members were the only ants which victoriously resist raids by nomadic Dorylus army ants. A very large genus with considerable taxonomic confusion. 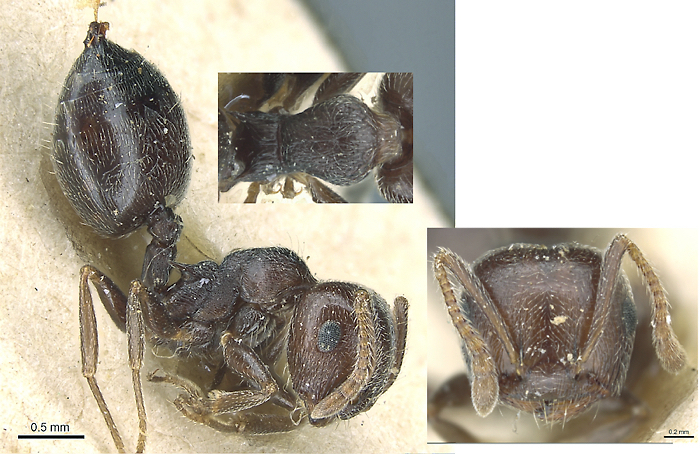 Bernard (1952) wrote of the Crematogastrini, with its single genus Crematogaster as the most intricate and difficult to classify of all the tropical ants. Even W.M. Wheeler, probably the most familiar with the ant fauna of the globe, had left it to Santschi to catalogue the Crematogaster of the Congo. The evidence from Santschi's collection showed also that he was full of uncertainty over the genus. Nevertheless, Bernard noted that 136 species had been described from the continent, with 74 known from French West Africa and the Congo. In itself this number was not terrifying, indeed it was surpassed by Camponotus but they were manageable in taxonomic terms. 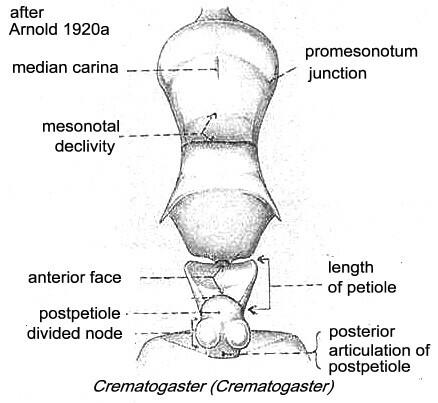 The problem with Crematogaster, however, was the extreme variability of workers from one nest to the next. For example, he had studied the species Crem. aïrensis inhabiting Tamarisk trees growing at a small oasis in the Fezzân area of Algeria. Within that tiny location the ants changed significantly from one tree to another in colour and sculpturation so much as to lead one to doubt their common identity. If such variation could be observed there, then what problems might one find in tackling the diversity of forms in the tropical forest? This was not helped by the relatively few specimens collected at any one locality by most expeditions to Africa. Thus, he concluded that the number of named forms was almost certainly overinflated and revision, especially on the basis of males and queens, was needed. Diagnostic Features - Antennae 11-jointed. Frontal carinae well developed. Petiole broadened in front and trapezoidal, sometimes truncated or rounded at the anterior angles, sometimes oval. Postpetiole grooved, or sometimes merely impressed. A useful key is by Collingwood (1985) for Saudi Arabia. Key to workers from Egypt (based on Finzi 1936, Santschi 1937e, and Collingwood, 1985). -- Listed by Finzi (1940) this seems to be an error for auberti nigripes but a description is provided.